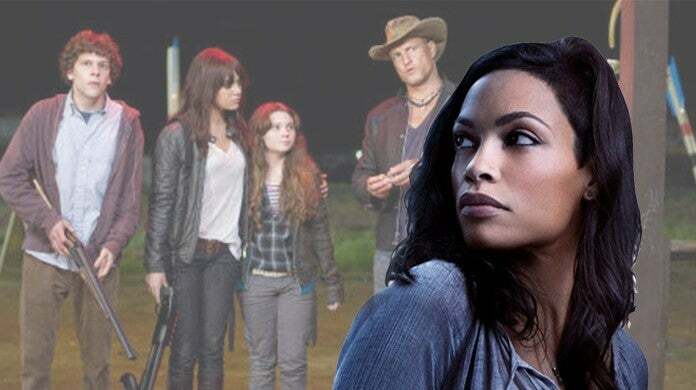 Rosario Dawson has joined the cast of Zombieland 2. With the original cast of Zombieland returning for the long-awaited sequel, Dawson is not the only newcomer. Also new to the film are Zoey Deutch and Avan Jogia. Rumors online also point to Dan Aykroyd playing a part, with Bill Murray possibly returning to the film. Dawson's role in the fulm has not yet been revealed. Dawson is best known for her role as Mimi Marquez in 2005's Rent movie. She also voices Batgirl in The LEGO Batman Movie, played Zoe Perez in Eagle Eye, and has portrayed Marvel character Claire Temple in the Punisher, Daredevil, Luke Cage, Iron Fist and Defenders shows on Netflix. Since Zombieland released in 2009, its cast of Woody Harrelson, Emma Stone, Jesse Eisenberg, and Abigail Breslin have all created (or continued) impressive careers individually. Not only did the scheduling stars have to align in order to bring the gang back together but the cast members had a certain stipulation prefacing their return: a high-quality script. Speaking to ComicBook.com around the release of his Venom movie, Zombieland director Ruben Fleischer opened up about the upcoming sequel. "Well the reason we're all doing it again is 'cause a we all love the world of the movie so much," Fleischer said. "I think it was a real touchstone for all, for me certainly 'cause it was my first movie, but I think for Emma and Jesse it was a really just significant movie in their evolution. And Woody paid me a huge compliment. I was on the phone with him the other day and he said he's probably made over a hundred movies but the most fond memory he has is making Zombieland." The entire group, actors and crew alike, had a great time working under Fleischer on Sony's Zombieland a decade ago. The fun wasn't sufficient to bring them back for another go -- it was always going to require a high-quality film. "I think we all have this honest nostalgia for the experience of making it and with that being said none of them would agree to do the movie until the script was good enough," Fleischer explained. "And we've been working on it for four years and have made sure that if we're gonna do it again it's at least as good if not better than the original and finally I think we have a script that we all feel really confident in go making and yeah, 'cause it's such a precious thing none of us want to tarnish its place, we only wanna build upon it." Fleischer returns to direct Zombieland 2 on a script from Rhett Reese and Paul Wernick. Zombieland 2 hits theaters on October 11, 2019.